at the Millennium Knickbocker Hotel. April 19 - Five preconference workshops were held Wednesday evening. The workshops were over a wide range of topics and were attended by more than half of the delegates to the conference, which began the next morning. Jeanette Potts, MD, speaking at a workshop on the types of urinary incontinence and its complexities. Professor Christine Norton is seen here describing the types of bowel incontinence to workshop attendees. Ms. Kaoru Nishimura, RN, from Japan, describes the newest Japanese incontinence products to workshop attendees. Dr. Margaret Macauley and Dr. Jeffrey Albaugh presented other new products to attendees entering the US and European markets. Dr. Catherine Murphy describes issues with urinary catheters at a Wednesday night workshop. Denise DeLuca introduced workshop attendees to the concept of using biomimicry in engineering and product development at a workshop. 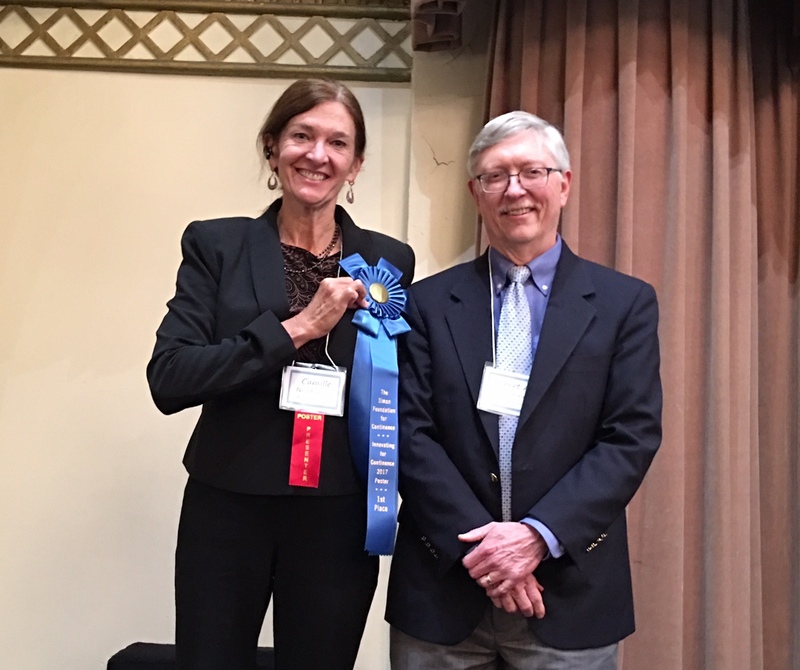 In a final workshop, Professor Alan Cottenden and Dr. Margaret Macauley presented new containment products to attendees. Photos from the Plenary Sessions (April 20-21) with presenters from around the world discussing a wide range of topics including: incontinence and geriatrics, new technologies for better treatments for patients with incontinence, technologies that may lend themselves to the field of incontinence but that are not being used yet such as origami and 3D printing, new devices that are not yet well known,a brief history of incontinence products, and many more. For information on the full program and the speakers, check out the program and biographies for 2017. We could only post a few of the speakers and the topics covered here. the ongoing Chair for the conference series. Tomas Griebling, MD and Dr. Richard Day answering questions during a discussion period. Honorary Conference President, Dr. Diane K. Newman, reviewing 30 years of product development for urinary incontinence management products. Professor Cottenden and people with incontinence discussing living with incontinenece and continuing product needs. Carol Stevenson and Twila Yednock greet all our attendees and answer all the questions! The Innovating for Continence website's content is for informational purposes only and does not replace advice from health care professionals. Nothing contained on this site is intended to be used for medical diagnosis or treatment. We make no endorsement, representation or warranty of any service or product listed on our website, or held within the websites of any links found on our site.